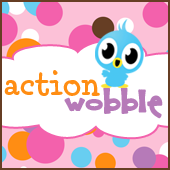 Action Wobbles: Kick your heels up! I'm happy to share this card with you today. I used a fun set from DeeDee's digis, creating this easel card. The boot is mounted on an action wobble so it can "kick up it's heals"
I used some trendy twine in the card as well.